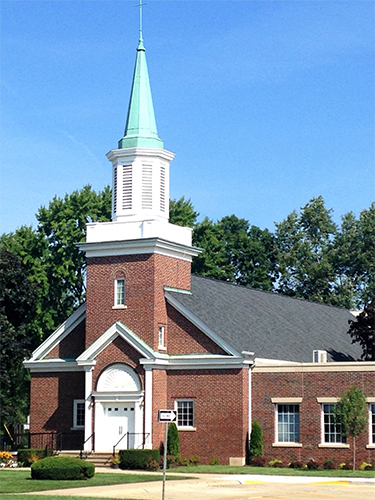 Serving the Downriver communities for well over a century, St. Paul United Church of Christ is one of the oldest and more historic churches in Taylor. Founded by German farmers who settled in Taylor, Romulus, and Ecorse Townships, the congregation has grown along with the local communities its serves. Today, it continues to offer an active, vital ministry in the name of Jesus Christ to the Downriver and Dearborn communities. St. Paul United Church of Christ had humble beginnings. It started when a group of local residents asked the Reverend C. Fitzer, pastor at St. John's Evangelical Lutheran Church in Wyandotte, to conduct worship services for them at the Sand Hill School, located at the southeastern corner of Telegraph and Pennsylvania Roads. Within a short time, however, a decision was made to formally organize as a church. Accordingly, a meeting was called for March 26, 1883. Twenty-five families signed a charter on that occasion establishing "St. Paul Evangelical Lutheran Church." At another meeting on April 18, 1883, a decision was made to construct a church building on ground donated by Mr. Joseph Miller in Taylor Center on Goddard Road, near Telegraph. A white 30' x 50' white frame building with a seating capacity for 225 worshippers was erected at a cost of $1205.29 and dedicated to the service of God on May 4, 1884. The first parsonage, a Victorian-style frame structure, was built in fall 1885. Sadly, the original frame building was struck by lightning on May 31, 1911 and burned to the ground. Undaunted by this calamity, however, the congregation gathered for a special meeting on June 18, 1911 and voted to rebuild. The cornerstone for the new church, engraved with the German words Erbaut im Fahre des Herrn 1911 (English language translation: "Rebuilt in the Year of the Lord 1911"), was laid on August 20, 1911. The new red brick church, consisting of a 36' x 50' sanctuary and a 14' x 24' classroom, was dedicated on May 12, 1912. During the following decade the growth of the congregation necessitated the construction of an adjoining parish hall, which was finished in 1925. The exterior and interior of the church building proper were also remodeled in summer 1929, just months before the onset of the Great Depression. At that time, the church's spire was removed, leaving only a crenellated or scalloped bell tower. A chancel was simultaneously added to the front of the sanctuary, displacing a raised pulpit, two religious wall paintings depicting the nativity and Jesus at Gethsemane, and an altar adorned with a statue of Jesus. The church organ was removed from its original location in the balcony and placed in the new chancel. New furnishings were acquired, including an altar, two ceremonial chancel chairs, pews, light fixtures, and stained glass windows. The total remodeling costs were $15,000. Despite this considerable expense and the difficult economic times which soon followed, the congregation was subsequently able to replace its original, adjoining white frame parsonage with a handsome Tudor-style residence. Financed by the St. Paul Ladies' Aid Society, the new parsonage was dedicated September 17, 1933 as part of the congregation's fiftieth year anniversary celebrations. Further change for the St. Paul congregation came in 1946 when Wayne County decided to widen Goddard Road, seeking and acquiring from the church body street frontage running twenty ​seven feet deep. Rather than move the existing church building further back, the congregation voted to raze the church and the separate parish hall, replacing both with a single, integrated facility. The old parish hall was the first to go. It was demolished on April 14, 1947, creating the space necessary to begin work on the new church building and hall. On October 5, 1947, the congregation gathered for its last worship service in the old sanctuary. Thereafter, services were briefly held in the new fellowship hall until the new sanctuary could also be readied. Finally, on May 23, 1948, the new church building and fellowship hall, designed in a Colonial Revival style by architect Earl L. Confer (see brief biography below), were officially dedicated to the glory of God. The new church structure was further enhanced by the addition of a substantial Christian Education wing at its west side. Plans for this addition were initially approved by the congregation on April 24, 1955. Ground was broken on June 26, 1955 and the cornerstone was laid with appropriate ceremony on August 7, 1955. Dedication services were held on February 12, 1957. One further addition to the church facilities was made in 1971 with the construction of a more ample kitchen. At the same time, a breeze-way and garage were also added to the parsonage next door. The St. Paul congregation continues to make active use of its facilities for Christian worship, education, mission, and fellowship. Although the third and present sanctuary for St. Paul United Church of Christ was built in 1948, it is somewhat similar in interior design to its predecessor. Also, the new sanctuary incorporated numerous furnishings from the second building as restyled in 1929. This blend of old and new has created a handsome, intimate, and congenial worship space. During the 1929 remodeling of the second church building, memorial stained glass windows were installed, replacing earlier decorative glass employing geometric designs. Along with the Ladies' Aid Society, various families of the church, many locally prominent as farmers, subscribed to ten windows at a cost of $100 each. Each of these windows feature a motif combining a sea shell, symbolizing both Jesus' baptism and Christian pilgrimage generally, and a dove, representing the holy spirit. In addition, the St. Paul Evangelical League, a men's group, financed a double window that was installed above the altar in the chancel. In its upper reaches, the window was emblazoned with a white cross set inside a blue "shield of faith"--a reminder of the Apostle Paul's admonition to "put on the whole armor of God" (Ephesians 6:10-18). 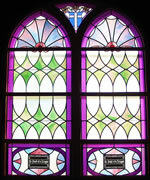 All of the stained glass windows were preserved and transferred to the new church building in 1948. Most of them adorn the present sanctuary.The double stained glass window from the previous chancel, however, found a new location along the east wall of the church's fellowship hall. One additional stained glass window was added to the sanctuary of the present building in 1953, commemorating the 70th anniversary of the church's founding. Positioned over the altar, the round stained glass window depicts Jesus in prayer at the Garden of Gethsemane in the aftermath of his Last Supper with disciples and just prior to his arrest by Roman soldiers. A closer look at the Gethsemane Window reveals several disciples sleeping in the background, prompting Jesus' poignant words to Peter: "Simon, are you asleep? Could you not keep awake one hour? Keep awake and pray that you may not come into the time of trial; the spirit is willing, but the flesh is weak" (Mark 14:37-38). The towers of Jerusalem are also visible in the window's background. The sanctuary of St. Paul United Church of Christ is graced by substantial oak woodwork, some of it from the previous church building. The pews situated in the balcony are from 1912. All but the last four rows of pews in the lower sanctuary are also from the, second church building, as remodeled in 1929. The altar and flanking chancel chairs were similarly preserved from the remodeled second church and fitted into the present sanctuary at the time of its construction. The paneling on each side of altar, plus the lattice work in the upper reaches of the chancel area, is, however, newer. They were crafted and finished by members of the church and first installed in 1948 and 1953, blending with the older sanctuary fittings from the second building. The impressive chairs flanking the altar were purchased for church use in 1929. The sanctuary woodwork, particularly in the chancel area, is rich in religious symbolism. The altar, for instance, is shaped like a tomb, a reminder of the ancient days when Christians, hidden in the catacombs of Rome, celebrated Holy Communion upon the grave monuments of the beloved martyrs. In addition to its significant shape, the altar is distinctively adorned with various Christian motifs. The words, "Holy, Holy, Holy," for instance, appear just above the altar surface, separated by Crosses Patee. Decorating the perimeter below the altar surface are three Greek Crosses with arms of equal length. Meanwhile, the lower front of the altar bears in the left and right panels, respectively, the first and last letters of the Greek alphabet, Alpha and Omega, an ancient reminder that Jesus is "the first and the last, the beginning and the end" (Revelation 22:13). The front center panel of the altar features a raised Latin Cross and the sacred monogram, "IHS," which has many interpretations. The Latin words Iesus Homininum Salavator(Jesus, Savior of Men) are often used to explain the monogram. But also popular as an interpretation is the German phrase Jesus, Heiland, Seligmacher(Jesus, Lord, Savior). The uppermost reaches of the altar display a pair of Christmas roses, symbolizing Jesus' nativity, and a long-stemmed daisy, an emblem of the Christ child's innocence. The lattice work on the two sides of the chancel features a series of quatrefoils, a leaf having four foils or lobes. The quatrefoil, a popular motif, is symbolic of the four gospels and the four evangelists. The sanctuary ceiling, which was originally tiled, was refurbished using finished pine in the 1970's. On the altar of the present sanctuary are various brass liturgical items which serve as a focus in worship. At the center of the altar, on a wooden pedestal, is a three-stepped brass Calvary Cross. The pedestal steps signify faith, hope, and love (1 Corinthians 13:13). The Calvary Cross--also known as the Graded Cross--is marked with the IHS (Iesus Homininum Salvator--Jesus, Savior of Men) This stylized cross represents our finished redemption in Jesus and a risen Christ reigning from a throne in heaven. The cross is flanked by two brass candlesticks and vases. The vases are also inscribed with the IHSsacred monogram set in a quatrefoil. The open lectionary or book of lessons with prayers, which is placed in front of the altar cross, is a reminder of the centrality of the biblical scriptures in the worshiping life of our Protestant community which, like other United Church of Christ congregations, traces its heritage to the sixteenth century Reformation of Martin Luther, John Calvin, and others. At the time of Holy Communion, special communion trays, containing grape juice and bread wafers, are placed on the altar. On Maundy Thursday and other special occasions, the church's historic communion silver, dating back to the turn of the twentieth century, is used. Throughout the year, the pulpit and lectern of St. Paul United Church are decorated with various silk paraments or hangings. Each parament bears its own special symbol. The colors of the paraments change, marking the different seasons of Christian faith. These seasonal parament colors include blue (Advent), representing the deeply spiritual; white (Christmas, Epiphany, and Easter), symbolizing joy, light, purity, glory, and perfection; purple (Lent), symbolizing humility, penitence, preparation, and the mourning of kings; red (Pentecost and Reformation Sunday), associated with zeal, spirit, and the blood of martyrdom; green (Sundays following Pentecost), suggesting life, growth, and hope; and black (Good Friday), an expression of grief and sorrow. The St. Paul sanctuary is lit by a pair of glass globe chandeliers, various wall sconces, and recessed spotlights. The chandeliers and wall sconces, which today qualify as antiques, are from the congregation's second church building and were first installed in 1929. Until the ceiling of the present sanctuary was refurbished, the chandeliers could be lowered for cleaning. Today, a tall ladder or high platform must be used. Ornamental lighting is additionally provided in the chancel area by two red-globed electric "eternal lights," which flicker day and night. Eternal lights are customary in many synagogues and churches, fulfilling a biblical admonition (Exodus 25:37). Also, an eternal light in a church sanctuary is a reminder that Jesus Christ is the embodiment of God's Word and a light to the world. As the Apostle John proclaims: "Through him God made all things, not one thing in creation was made without him, The Word was the source of life, and this life brought light to people. The light shines in the darkness, and the darkness has never been put out" (John 1:3-5). The presence of two eternal lights signifies, like the pair of candles on the altar, Jesus' two natures, human and divine. Alternatively, they can be said to symbolize the Old and New Testaments, the two perpetual "lights" of our faith. A new pipe organ was installed in the present church building at tile time of its dedication in 1948. Manufactured by the highly respected M. P. Moller Company of Hagerstown, Maryland at an original cost of $4451.00, the organ (Opus 7556) has two manuals and an electrified blower. As a part of the seventieth year anniversary celebration for the church, the organ received a set of Vox Humana organ pipes. Memorial chimes were also added. More recently, in 1995, the chimes were replaced and expanded. Often a chime peel marks the start of Sunday morning services. A piano is also regularly used to accompany services at St. Paul United Church. The present upright piano found in the sanctuary is manufactured by the Wurlitzer Company and was given as a memorial to the church. In additional, a digital or electronic piano was donated for sanctuary use by Rickey and Patricia Rossi in 2000. During the 1940's, church member Ernest Block, husband of former church organist Minnie Block, occasionally accompanied special services of the congregation with his violin. A large drawing of the violin now hangs in the church parlor. On Sunday morning and other occasions, the start of the worship is marked by a ringing of a church bell in the belfry, which is entered through the sanctuary balcony. The single bell with two different chimers is also used to toll deaths within the congregation, both at funeral services and at Totenfest, an annual remembrance of church members who have died during the past year. The bell, which has a three foot diameter and a five foot wheel to ring it, is positioned in its original timbers (10' x 10'), also taken from the 1911 church building. The bell was installed in the present building in 1948. Bell markings specify its manufacturer, "STUCKSDEL BELL FDY CO, ST. LOUIS, MO 911." The belfry tower is topped by a copper-plated spire with a cross. The tower calls to mind Proverbs 18:10 in which God is likened to a "strong tower where the righteous can go and be safe." Pointing to the heavens, church spires have traditionally symbolized God's love for the world and the reconciling work of God's people below through worship, prayers, and hymns. The belfry tower and spire stand out against local skies. Mesh facing inside the belfry helps to keep both birds and bats out! St. Paul United Church of Christ has three cornerstones which offer their own witness to the history of our congregation. The oldest cornerstone, engraved with the Germans words, "Erbaut im Fahre des Herrn 1911" (English language translation: "Rebuilt in the Year of Our Lord 1911") is found on the lower wall of the narthex next the steps to the balcony. Origin-ally part of our church's second building as constructed in 1911, it was re-moved and preserved before the rest of the brick structure was demolished to make way for larger, brand new church facilities. A second church corner-stone is located at the east outside corner of the sanctuary facade. It simply reads: "St. Paul Evangelical and Reformed Church 1948." 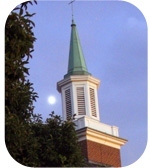 The cornerstone reflects the name and denominational affiliation of our church prior to the merger of Evangelical and Reformed congregations with the Congregational Christian Churches to form the nation-wide United Church of Christ in 1957. Our church became "St. Paul United Church of Christ" at that time. Our third cornerstone is found on the west wing of the church near the west side entrance. It simply testifies to the year--"1955"--that the Christian education wing was added to our facilities during the pastorate of Reverend Leonard Wiegel. A large kitchen addition to the church, finished in 1971, has no cornerstone. Several memorial plaques can be found displayed in our building. Two of them, located in the church narthex, just outside the sanctuary, respectively list our pastors and our Council presidents since the founding of the church. A third narthex plaque lists the names of those church members whose cremation ashes have been interred in the St. Paul Memorial Garden along the west outside wall of the sanctuary. A bronze plaque on a wall next to a small out-door courtyard in a hallway area behind the sanctuary provides information about the dedication of the St. Paul Memorial Courtyard, plus the successive denominational affiliations that our congregation has known over more than a century of shared Christian ministry. Recently added, a commemorative lunette with a hand-carved black walnut bell and a mahogany-inlaid inscription: "1911—Centennial Bell." Julius Enesy, who crafted the lunette, presented it to the congregation as a gift and memorial for his late granddaughter, Christy Lynn DePriest Wright. As announced, the half-moon shaped lunette will enjoy a permanent place of honor above the belfry door in our sanctuary balcony area. The St. Paul Memorial Courtyard was officially dedicated at a "Homecoming Sunday" Service on October 11, 1992. Funds for the memorial refurbishment of the courtyard, which had previously been bare and unadorned, were contributed by a member of the congregation, the late Donald Gruenberg. The courtyard honors the Apostle Paul, who gives his name to our church. The statute of the Apostle Paul which stands at the center of the courtyard was hand-carved in Italy using marble from the same quarry which supplied stone for some of Michelangelo's greatest sculptures. Paul is depicted holding the Holy Scriptures and a sword in his hands. The sword is a symbol of Paul's ultimate martyrdom as a Christian during the reign of the Emperor Nero in 67 A.D. Since Paul was by birth a Roman citizen, he--in contrast to Jesus and the Apostle Peter--had the "privilege" of being decapitated by the Roman authorities, which was a less painful and brutal way to die. The sill behind the statue of Saint Paul invokes his famous declaration: "We have been made full in Christ" from Galatians 3:28. More contemporary translations of this same verse from the original Koine Greek (Greek dialect employed by ordinary people that Paul preferred in writing and speaking) render it somewhat differently. For instance, as the Revised Stand Version Bible translation of the same passage from Paul's letter to the Galatians states: "There is neither Jew nor Greek, there is neither slave nor free, there is neither female nor male; for you are all one in Christ Jesus." Meanwhile, other courtyard sills record the names of the ancient towns and cities which Paul knew and visited as Christianity's greatest missionary and evangelist to the gentiles. The cities memorialized in this fashion are Galatia, Thessalonica, Corinth, Rome, Colossae, Ephesus, Tarsus, Damascus, and Jerusalem. Paul was born in Tarsus, a Greek-speaking port city on the Mediterranean in present-day eastern Turkey. He was on the road to Damascus from Jerusalem when he mystically encountered Jesus Christ and was converted to Christianity. The New Testament canon includes "epistles" or letters which Paul wrote to the Galatians, the Thessalonians, the Corinthians, the Romans, the Colossians, and the Ephesians. The St. Paul Memorial Courtyard also features a marble pedestal for the display of seasonal floral arrangements. The top of the pedestal can be removed, revealing a baptismal fount. The pedestal is decorated on one side with a spray of dogwood, a symbol of eternal life. The other side of the marble displays the emblem of the United Church of Christ, which is based on the Christian symbol known as the Cross of Victory or the Cross Triumphant. It signifies the kingship of the risen Christ over the entire world. The orb, representing the world, is divided into three parts to signify Jesus' command to "be my witnesses in Jerusalem and in all Judea and Samaria and to the end of the earth" (Acts 1:8). Besides incorporating the United Church of Christ name, the surrounding ellipse or oval includes the words of Jesus' inspiring prayer that his followers "may all be one" (John 17:21). Earl L. Confer, who served as architect for our church building as erected in 1948 with the addition of a west side Christian education wing in 1955, was born in Crawford, Nebraska in August 1901. He was educated at the University of Illinois. He began his career as an architect in approximately 1928, devoting himself mostly to the design of churches and church-related buildings. His architectural firm was located on the west side of Detroit at Hubbell Street and Grand River Avenue. Other churches designed by Earl L. Confer are located at Greenfield and Grand River Avenues and Lawnacre and Schoolcraft Streets in Detroit. Confer died in 1968. As our church contemplates a significant expansion of our building facilities, it is committed to maintaining its present red-brick Colonial Revival style. Harold H. Fisher Associates, the Harper Woods architectural firm retained by the church to prepare the now- completed architectural plans, was selected because of its reputation for the quality of its traditional church designs. The project architect, David Lavender, later discovered that he had personal ties to our church: his parents were married in the present sanctuary shortly after it was constructed in the 1948. An artist's sketch of our proposed building expansion, based upon the comprehensive blueprints prepared by the architectural firm, is prominently displayed in the west lobby of the church. St. Paul United Church of Christ maintains a display of additional historical memorabilia in the west lobby of the church. Photographs of past pastors, along with pictures of our church buildings from various periods, are highlighted. The exhibit also includes such church artifacts as prayer books, hymnals, hand-sewn communion cloths, as well as attendance pins and other gifts presented to church school students more than fifty years ago. Other interesting artifacts on display in the hallways of St. Paul United Church include two framed, colored lithographs, "Das Leben Jesu Christi" and "Die Reformation," respectively recounting in words and pictorial scenes the life story of Jesus Christ and the formative events of the Protestant Reformation under the leadership of Martin Luther. Designed and printed by the Martin Yauch Company in the early 1880's for sale to members of German-speaking congregations like St. Paul Church, the two pictures were presented as gifts to the church in the 1990's. Two additional original art works on non-biblical subjects, plus a couple of tapestries, complement the small St. Paul United Church collection. A pastel drawing of a violin and bow by artist Paul Koehler currently hangs in the church parlor. Commissioned by Ernest Block, the drawing features the cherished string instrument that he used as a soloist and accompanist at worship services held at St. Paul United Church in the 1940's. The drawing was later purchased by Willard Koths for display at the Colonial House Restaurant and then subsequently presented as a gift to the church. Also noteworthy is an oil painting, entitled "Deep Forest," by the German artist J. Silvana. The painting, presumably, a German Black Forest scene, was donated by Harry and Doreen Thompson. A tapestry, woven and purchased in Spain, portraying Jesus' last supper with his disciples in an upper room in Jerusalem hangs on the upper reaches of the south wall of Fellowship Hall, presented by church member Genny Thomas. A framed Belgium tapestry depicting harvesters hangs in the east lobby, a gift from Donald Gruenberg. The walls of St. Paul Church are decorated with many other photographs and art prints that remind us of our rich legacy of history and faith.